Well, I have been slowly dispensing with a winter turnout rug for Bea, my non sweet itch girl. Over the last few years I’ve been putting her rug on later and later and taking it off earlier and earlier so this winter I thought I’d try to do without. I only weakened and put one on recently when she was beginning to stand at the gate of her field a lot when the grass got very tired and poached. She’s quite a lucky girl as, at the local livery we use, she has a little yard of her own at night with a stable that she can pop in and out of and there’s a light on all night because she has poor eyesight. I tend to get to her around 2pm to groom, ride and pop her away for the night on a clean bed of straw. She doesn’t have shelter when she’s turned out in her field during the day so I feel I have to compromise if the weather is really foul, and put a rug on. I always put a medium fill on even though she’s unclipped because the rug flattens the hair and destroys its thermo-regulating properties. A thin raincoat would be worse than no rug. Of course this means that I have to be careful not to use the rug if the weather is mild as she’d overheat and that would be worse than being a bit cold because a horse can’t get themselves cool in a rug whereas she can be more active or eat more hay to warm herself up if she needs to. Quite often I bring her over to our village for a few days to be with our ponies. We rent a dry 10 acre field for 6 months of the year with high hedges for shelter so she runs naked with the ponies and she loves making up for the grass shortage at the livery yard. Trouble is - riding is poor around us so I have to take her back to the yard if I want to ride. Fifthly, and worst of all, I think I enjoy buying things for my horse and a brand new rug is an exciting thing to buy. I’ve now made a promise to myself only to rug her for the right reasons – that is, if the weather is simultaneously cold, 24 hours or so of near constant rain and windy, and she can’t shelter. I admit to feeling pleasure when I see her out on the field looking like a natural horse, naked and yes - covered in mud most days! 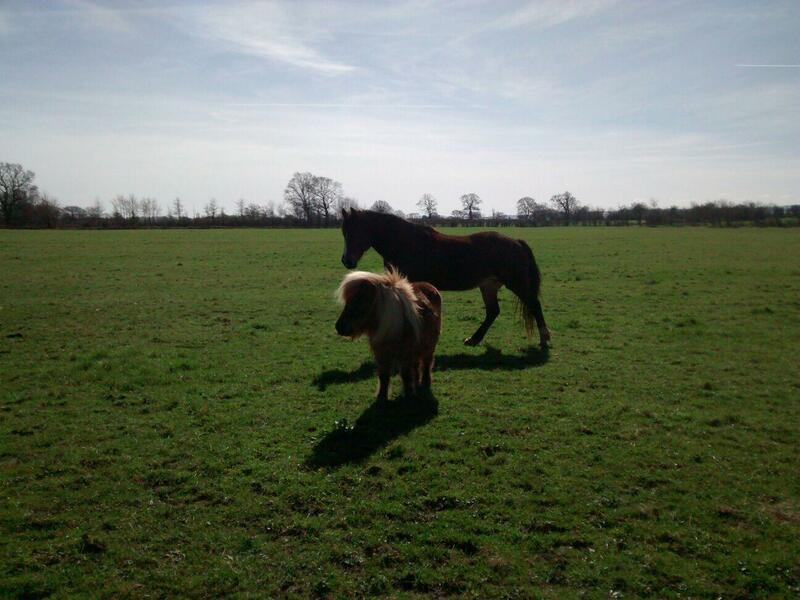 Bea and her friend Blondie enjoying the lovely Spring weather today.